Well, let’s put it this way: If you had the chance to pay $26.99 to read Earnhardt’s previously top-secret notes from his iPhone — the ones he wrote to leave a trail in case something horrible happened — would you do it? Because that’s a lot of what you’re getting in Racing to the Finish. Earnhardt reveals all sorts of details about his battle with concussions, including information he writes would probably be new even to his own sister. Co-author Ryan McGee is able to smoothly weave Earnhardt’s words with the actual notes the driver kept on his phone, which were updated with every new symptom or development. McGee also talks to key witnesses like Rick Hendrick and Brad Keselowski, using their memories to supplement Earnhardt’s account while retaining the driver’s voice. What’s eye-opening is this book goes far beyond the previously reported concussions, like the ones that kept him out of the car in 2012 and 2016. These include concussion symptoms even from years he kept racing — including his final season last year. As it turns out, Earnhardt also experienced symptoms in 2014 and 2015 — well after he had become the sport’s unofficial spokesman for head injuries. During the times when he was publicly urging other drivers not to hide any of their concussions, Earnhardt acknowledges he was a hypocrite by not telling anyone — even the people closest to him — about what he was experiencing. That underscores what a difficult and ongoing fight this is for athletes in a tough-guy sport that revolves around individuals, many of who don’t have good job security. Despite being a relatively easy read, Racing to the Finish is not a fun one. This is a heavy topic, and those who are familiar with Earnhardt’s career don’t need foreshadowing to know what’s coming in the pages ahead. It’s uncomfortable and unpleasant, but it’s also necessary to understand the reality of concussions. And Earnhardt lays it all out there this time; it’s hard to imagine any details he decided to keep to himself. What’s the motivation for writing this? The primary goal is to help encourage others with head injuries to get treated — and Earnhardt makes it clear there is treatment and help, which didn’t seem to be the case a decade ago. On a personal note, it was a bit difficult to learn the reality about some of the incidents Earnhardt describes. One of the notable events in the book is when Earnhardt starts to experience problems with his vision during a visit to the Nationwide Children’s Hospital in Ohio. I happened to shadow him that day for a USA Today story and interviewed him, yet I had no hint he was ailing. Perhaps that goes to show how good he got at regularly hiding symptoms, a ruse which he says extended even to his wife, Amy. But that also highlights why it’s so important for NASCAR to get better at diagnosing concussions and making drivers spend extra time in the infield care center after crashes. If Earnhardt kept covering up his concussions — even in recent years when he was in the spotlight for them — who knows how many other drivers continue to do the same? 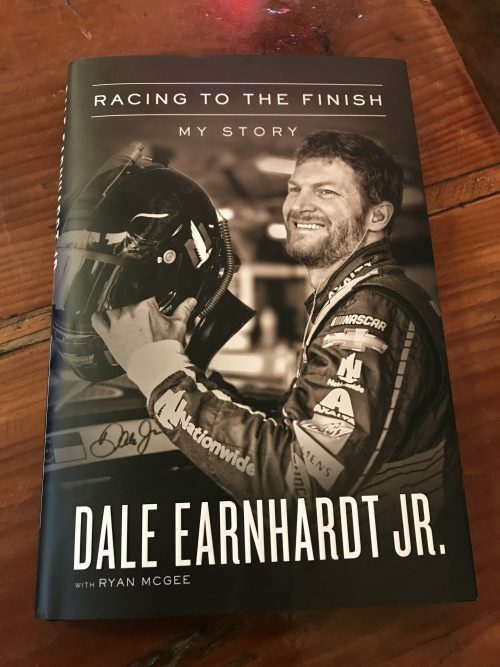 The bottom line on this book: There’s zero chance you’ll read it without learning something new about what Earnhardt experienced in recent years. You’ll also walk away with a greater understanding of an important topic that continues to be relevant not just in sports, but society in general.